Portugal is an amazing country with fabulous vistas around every corner. I made an 8.5 x 11 inch 2016 calendar as a little gift for you to download to your computer. I have thousands of images so it was hard to choose just six. Share my calendar with a friend and feel free to print it and put it up so that you can see a year at a glance. Enjoy. I haven’t written a post for a year and today is the day to reach out again. You see, I fell in love and my life has changed what seems to be 180 degrees. During each of my three visits to Portugal since March 2012, I fell in love more and more with so many facets of this beautiful country that it will be hard to explain. If you are a traveller, or love light and stunning landscapes, or have the heart of a dreamer, you will understand me. I’ve travelled in many countries in the world and none have captured me in the way of the land of my new home. I am not short on incredible life experiences. Among many things, I have seen magnificent stars in the inky sky up north in the wilds of Thailand, vistas that go on for miles in the Masai Mara of Kenya, the varied turquoises of water in the Caribbean, and the golden glow of sun against proud cypress trees in Tuscany. Yet I fell in love with Portugal. I spent a month is the Sintra area in the fall of 2014 and, even though it rained many days, the skies were azure blue when the sun appeared and the lanes were redolent with the fragrance of autumn flowers. My amazing Portuguese friends, Jose Antunes and Fernando Picarra, took me to explore places that most visitors don’t see. They are not on tourist maps or “must see” places. The pristine beaches washed of summer suntan lotion, the craggy cliffs overlooking tiny villages, and quiet forest paths that lead to flashy blue dragon flies flitting over ponds filled with croaking frogs and jumping fish spoke to me and gave me dreams of wanting even more. Two of the best days of my life were had in Portugal. How could I not want more? I returned to Vancouver mid-October sad and, in some ways, grieving the closure of those happy days. I had layers of rich memories and countless lovely photographs to remind me. There was a stirring and I tried to deny it. My closest friends noticed a change in me. I was glowing and smiling more. I’m typically a pretty happy person but I guess I had some kind of tangible essence that reached beyond my beating heart. When Jose sent me this photograph he took of me during my visit in March 2014, I knew I loved Portugal because I was so happy there. I couldn’t explain it. I just felt it. Recently retired from a career I loved and with a new found freedom, I took a huge leap of faith. Thanks to email and FaceTime I knew I could stay connected with family and friends. So, after a lot of soul searching, I made a decision. Last March, I said very teary farewells to my loved ones in Vancouver and headed out to explore a new life in Sintra, Portugal. I have so many stories I want to share with you. I plan to start a new blog with everything from tales of my adventures and challenges, to thoughts on photography and artistic pursuits, quotes I love, and ways I find inspiration that may give you some ideas too. I think I’m ready to start again and will give you the link to my new blog once I have it up and running. Wishing you countless blessings, love of family and friends, and a good sprinkling of wonder in your life. It’s hard to believe that 2014 is drawing to a close and that we are looking ahead to the new year. I hope you will be blessed with good health, prosperity, creativity, fulfillment and all you wish for. When I was in Kyoto, Japan, I was lucky to see people of all ages happily strolling in gardens and admiring the profusion of cherry blossoms. Since before the 8th Century there have been many meanings attached to them. For me, they represent freshness, rebirth, growth, and, sadly when they fall, the end of the wonderful moments in time when we are touched by their exquisite beauty and grace. It’s a reminder to be optimistic, make plans for happiness, seek what is good in each day, and to let things go when the time has come. I made this e-card with a photo I took of a cherry blossom last spring. There is a small rural road, not far from my place near Ft. Langley, BC, lined with cherry and plum trees. I try to go there every year to make images before the blossoms fall. Wishing you all the best and Happy New Year! Christmas day is just around the corner and I’ve been busy making preparations to celebrate with family and friends. 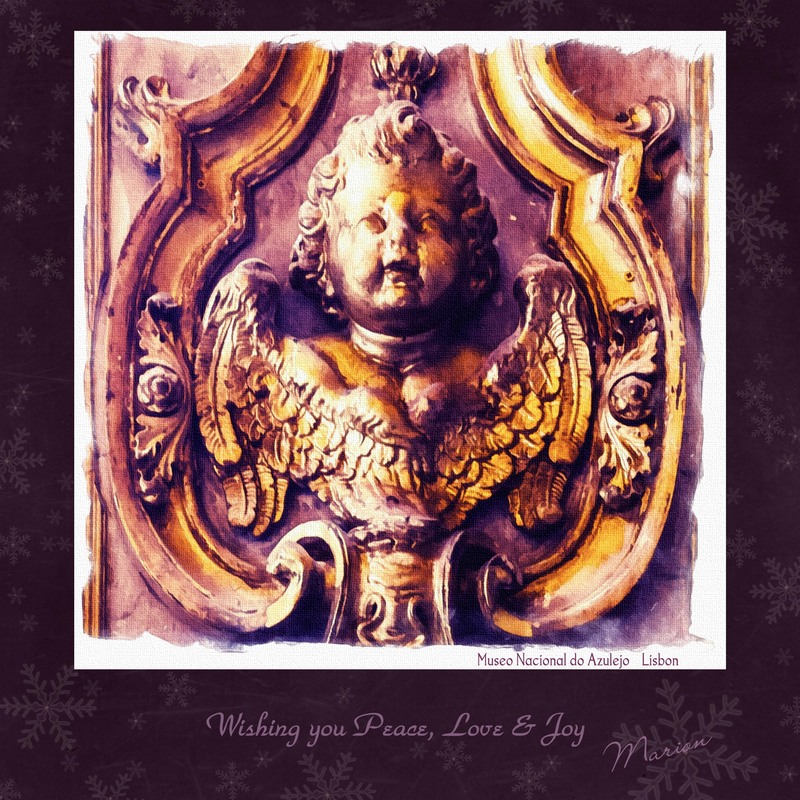 I like to send e-cards and created this one from a photograph I took of an angel on a pillar in the chapel of the Tile Museum in Lisbon, Portugal. I have countless images in my photo library that call out to be edited and shared. Now that I have finished my photo essay on Portugal, https://mccristall.exposure.co, and created an eBook on Lisbon, http://issuu.com/marionmccristall, I am starting to process some of the images I captured during my recent visit to Turkey. Istanbul is a fascinating city that blends modern and old worlds on both sides of the Bosphorus Strait. Formerly called Constantinople, it has been inhabited for thousands of years and includes land in both Europe and Asia. Everywhere you turn there are remnants and artifacts of previous civilizations as well as incredible museums, mosques, bazaars, and markets. There are limitless rich treasures waiting to be explored and enjoyed by visitors and those who live there. Below are three images I will be including in my photography eBook on Istanbul. I hope you have the opportunity to visit this vibrant, amazing city one day. I’ll post a link when my Memories of Istanbul eBook is complete and ready to share. Enjoy. Capturing the essence of a place is something I love to do with my camera in hand. Not only do I create mental visual memories but also images that I can look at and enjoy for years to come. After returning from my travels, I like to make sideshows, greeting cards, calendars, prints, and photo essays that depict my experiences. My photography e-book called Lisbon: The City of Seven Hills shows some of the countless sites I saw during my visits there in the last two years. I added post-processing effects in Photoshop CC and created the e-book in Lightroom 5 Book Module. You can browse my e-book, Lisbon: The City of Seven Hills, here http://issuu.com/marionmccristall/docs/lisbon_ebook_by_marion_mccristall Imagine the clang of the No. 28 Tram as it weaves through the neighbourhoods, brilliant terracotta rooftops, exquisite tiled facades, lemony coloured walls, twisty cobbled streets with laundry flapping in the breeze, leafy plazas with cafes, and historical sites at every turn. Enjoy walking in the streets of Lisbon through my eyes. Hopefully you will go there one day and take in the wonderful ambiance of such a magnificent city. Travelling gives us the opportunity to see, learn about, and make photographs of places and historical sites we don’t have access to in our local area. During a recent trip to Portugal I was invited for a private tour of the Archaeological Museum of Sao Miguel de Odrinhas in the Sintra area. It was fascinating to see the large collection of Roman artifacts and other ruins that were so well-preserved and on display. Discoveries of stones with inscriptions included influences from Italian, paleo-Hispanic, North African, and other origins were found across the region. People had been collecting everything from shards of pottery and tools to huge tombstones and Etruscan sarcophagi for hundreds of years. Scholars started a collection at the site in the hermitage of Sao Miguel in the 16th Century. This beautiful museum has been further developed and modernized so the antiquities could be gathered together in one place for all to see. There is an extensive library at the museum where researchers and visitors can take their time to learn more about the history of the region. A small chapel, with an ancient graveyard and Roman mosaic tiles embedded in the ground, is still in use today. Here is a short slide show of some of the images I took during my visit to the museum.